DreamLight brings your ideas and concepts to life with 3D concept design, illustration and animation. Armed with nothing more than a simple sketch or a brief concept description DreamLight will design and build 3D models and scenes in the virtual realm of computer graphics where the constraints of reality do not apply and the only limitation is the imagination. UCLA’s Department of Molecular, Cell and Developmental Biology needed to have a poster created to build excitement for their 16th annual International Vascular Biology Meeting, so they turned to the award-winning 3D illustration and animation studio – DreamLight Interactive. Supplied with a very rough sketch of the idea, basically a traffic jam on the main highways leading to UCLA where the the cars would be like blood cells flowing through actual arteries, DreamLight designed, modeled and rendered a 3D virtual scene that brought the concept to life in a high resolution image and poster layout suitable for large format printing. McGraw-Hill’s Thomson Learning Tools wanted to bring their time proven typing text book into the modern era with an edutainment CD-ROM. They also turned to DreamLight Interactive. After analyzing the existing text book and established typing pedagogy, DreamLight created the concept of building a 3D space ship where the ship’s control panel was actually a glowing keyboard. The student would perform typing drills to unlock the keys of the control panel thereby gaining access to additional functions and rooms throughout the ship. After bringing all systems online they would navigate the ship through a cyberspace network and bring a stranded little alien home in the process. DreamLight designed and created the 3D character, 3D space ship, 3D worlds and programmed it all into an award-winning 3D virtual adventure called KeyQuest. 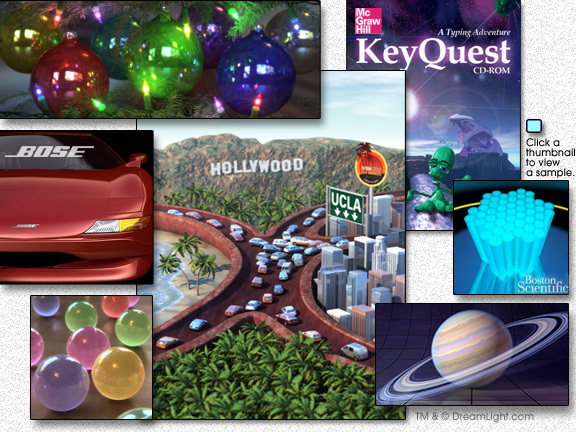 View DreamLight Insight #08: KeyQuest Edutainment CD-ROM for an in-depth, behind the scenes case study about this award-winning 3D interactive project. Bose – Back in the early nineties, when 3D computer generated imagery (CGI) was a very young art form, the senior art director of Bose asked for a miracle. DreamLight delivered with 3D spline based modeling & photorealistic 3D rendering to produce an award-winning 3D illustration. Bose needed a fictional sports car to serve as the centerpiece for an international advertising campaign. Since the campaign was targeted at the automotive industry, the images had to be photorealistic, without looking like any existing automobile, from any particular manufacturer. DreamLight designed, modeled and rendered the DreamLight classic, award-winning, 3D concept sports car, completely from scratch. View DreamLight Insight #01: Bose 3D Auto Rendering for a behind the scenes case study about this award-winning 3D spline based modeling project. If you would like DreamLight to create 3D concept designs, 3D conceptual illustrations or 3D conceptual animations for your next project, please contact us today.